HE Philippine Davis Cup team has Ruben Gonzales to thank following its rousing victory over Kuwait in their Davis Cup Asia/Oceania Group II tie on Saturday. Playing with a big heart, Gonzales survived gritty Mohammed Ghareeb to come away with a 7-6 (2), 6-2, 1-6, 6-7 (6), 5-5 ret win late Friday evening, which proved to be the turning point of the Filipinos’ first round tie with the Kuwaitis at the Valle Verde Country Club. Ghareeb retired after going down with a pulled muscle in his groin. Gonzales was on the verge of squandering a two-set lead when Ghareeb reached matchpoint in the 8th and 10th game. 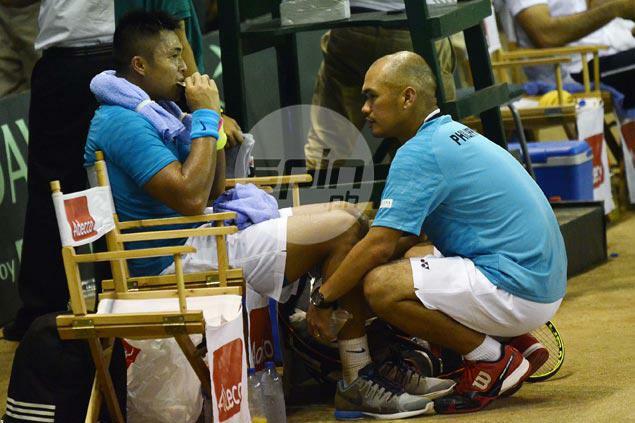 But the Filipino netter refused to wilt under extreme pressure and managed to force a 5-5 tie before his Kuwaiti opponent eventually gave in to exhaustion during the marathon, four-hour classic match. “He was the hero of that evening,” team manager Jean Henri Lhuillier of Cebuana Lhuillier admitted. Instead of a 1-1 tie, the win by Gonzales put the Philippines up, 2-0, in the best-of-five tie before the doubles match on Saturday where Treat Huey and Francis Casey Alcantara eventually cruised to a 6-1, 6-1, 6-2 win over Abdulrahman Alawadhi and Abdulhamid Mubarak to secure the first round tie. The Philippines will now face either Chinese Taipei or Malaysia in the second round slated July. Non-playing team captain Karl Santamaria admitted Gonzales was on the verge of giving up while the veteran Ghareeb, who nearly pulled an upset over former world No. 1 Roger Federer in a 2006 tournament, showed no signs of fatigue during the exhausting match. But Santamaria kept on motivating the 30-year-old netter, and was left impressed with how Gonzales was able to regain his focus and pull himself together during the course of the grueling match. “Until the fourth set, I felt that Ghareeb was controlling the match,” recalled the PH team non-playing captain. "Pinapalakas ko na lang ‘yung loob niya kasi magaling magtago ng fatigue si Ghareeb with his experience sa Tour. ?